HASSA, Turkey (AFP) - Turkish troops and tanks entered Syria on Sunday (Jan 21) to push an offensive against Kurdish militia as rockets hit border towns in apparent retaliation. The assault as drawn widespread condemnation, with France calling for the UN Security Council to discuss the crisis. Russia has also expressed concern, while the United States has urged Ankara to show restraint. Turkey on Saturday launched operation "Olive Branch" seeking to oust from the Afrin region of northern Syria the Peoples' Protection Units (YPG) which Ankara considers a terror group. But the campaign risks further increasing tensions with Turkey's NATO ally Washington, which has supported the YPG in the fight against Islamic State in Iraq and Syria (ISIS) militants and warned Ankara about distracting the focus from that fight. Defense Secretary Jim Mattis said Ankara had given Washington advanced warning of their operation, adding Turkey's security concerns were "legitimate". Turkish Prime Minister Binali Yildirim said troops crossed into the YPG-controlled region in Syria at 0805 GMT (4.05pm Sunday Singapore time), the Dogan news agency reported. Turkish troops were advancing alongside forces from the Ankara-backed rebel Free Syrian Army (FSA) and were already 5km inside Syria, state media said. An AFP photographer saw more Turkish tanks lined up at the border waiting to cross into Syrian territory. But a YPG spokesman claimed Turkish forces seeking to enter Afrin had been "blocked" and that it had hit two Turkish tanks. The Britain-based Syrian Observatory for Human Rights said a total of 18 civilians had been killed so far in the two-day operation, including eight members of the same family sheltering in a building that was flattened by an airstrike. The YPG confirmed the deaths, sending out pictures of Kurdish Red Crescent rescuers retrieving bloodied bodies from a collapsed concrete structure. But Ankara denied any civilian casualties, with Cavusoglu accusing the YPG of sending out "nonsense propaganda and baseless lies". Police stopped demonstrations against the campaign taking place in the mainly Kurdish southeastern city of Diyarbakir and in Istanbul, making arrests, Agence France-Presse correspondents said. 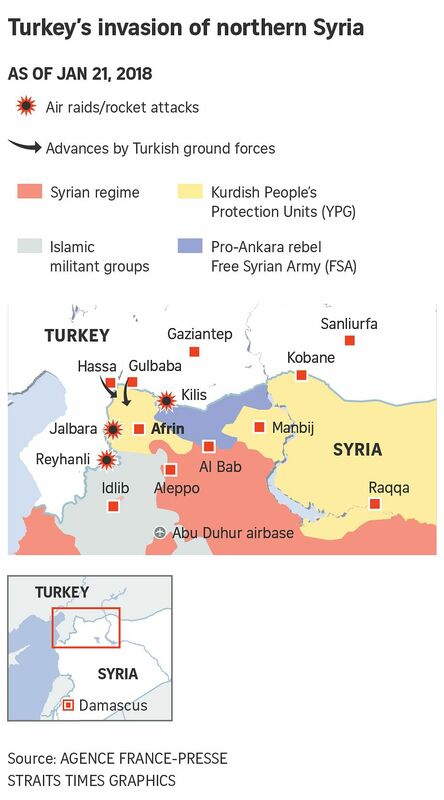 The operation is Turkey's second major incursion into Syria during the seven-year civil war after the August 2016-March 2017 Euphrates Shield campaign in an area to the east of Afrin, against both the YPG and ISIS. Turkey accuses the YPG of being the Syrian offshoot of the Kurdistan Workers' Party (PKK) which has waged a rebellion in Turkey for more than three decades and is regarded as a terror group by Ankara and the EU and US. Yildirim was quoted as saying that the Turkish forces aimed to create a security zone some 30km deep inside Syria. The new Turkish incursion has alarmed many countries, with the UN Security Council expected to discuss the worsening humanitarian crisis in Syria later on Monday (Jan 22) at France's request. French Defence Minister Florence Parly said the fighting "must stop" as it could deter YPG fighters helping the international coalition against ISIS. Foreign Minister Jean-Yves Le Drian said France was calling the UN Security Council meeting as it was deeply worried by the "brutal degradation of the situation" in flashpoints like Afrin. The Russian foreign ministry voiced concern and urged Turkey to show restraint, while the defence ministry said its troops were withdrawing from the Afrin area to ensure their security and prevent any "provocation". The Turkish foreign ministry said it had informed the Syrian regime - through its Istanbul consulate - of the operation despite being at odds with Damascus throughout the civil war. But the Syrian foreign ministry strongly denied this and President Bashar al-Assad slammed the offensive as "support for terrorism".